Industrial Robot Market Share in Japan, 2013 - How much is it in Tokyo? Nikkei press estimated the 2013 market share of industrial robot in Japan. The 2013 total sales of industrial robots were 150 billion yen. It decreased by 15.8% from 2012. 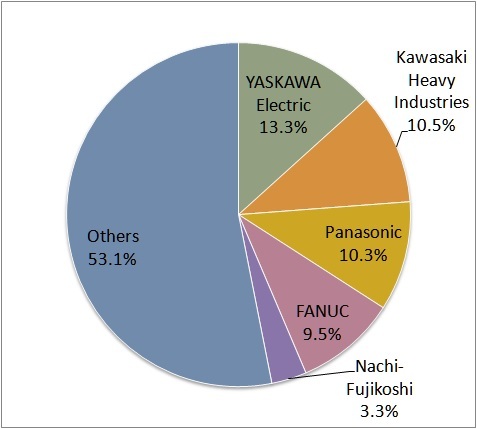 The following figure shows 2013 market share of industrial robots in Japan. The source of the market share is Nikkei Sangyo Shimbun newspaper, the article on 2014 July 28th.